I think they had me at pancakes! There is something subs out fluffy, golden pancakes that makes me smile. Pile on the butter and smother them in syrup, pancakes are something magical. Yes, I might be going a little overboard, but still pancakes are pretty darn good. 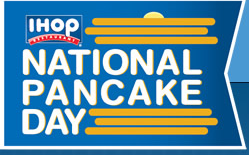 On February 5, pancakes at IHOP are even better because they are FREE. To raise awareness and money for Children's Miracle Network, IHOP will offer their signature buttermilk pancakes for free. Each guest can get 1 free short stack of pancakes, while supplies last and where available. Although it is not required, a donation to the charity would be appreciated. wahoo! Thanks for the great info!